Located right in the heart of Poland's developing and thriving capital, Warsaw, the brand new five star InterContinental Warszawa provides not only an architectural landmark as one of the highest buildings in the city, but also services that are tailored to and exceed the expectations of our discerning guests. In three restaurants and two bars, guests can sample the best of Polish and international cuisine. Eleven banqueting rooms, all with natural daylight, are available on two floors and can accommodate events for up to 700 guests. One of the most stunning features of the hotel is the Riverview Wellness Centre, located on floors 43 and 44, which offers a swimming pool, gym classes, fitness equipment, sauna, steam bath, solarium, massages and beauty treatments, all with a spectacular view of the city. 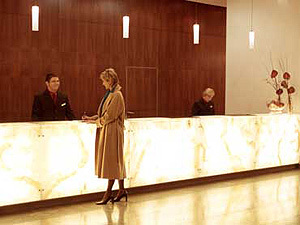 Unique to the city are the hotel's Residence Suites. These 75 comfortable apartments, in six different configurations, offer the ultimate services for those guests who wish to combine the advantages of having their own private space with the services of a five-star hotel. Fully equipped kitchenettes, comfortable furnishings and state-of-the-art technical equipment provide the feeling of a 'home away from home' that InterContinental is known for all over the world.